If you are already sick of seeing my log cabin pincushions,feel free to turn around and say adios now!If you have a bit of time to spare and don't mind seeingsome of the pincushions I made, thank you and here we go! 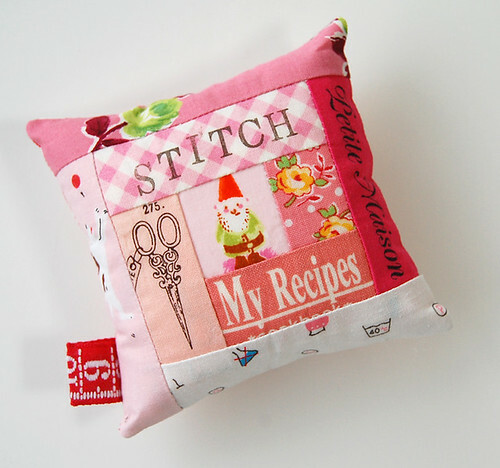 I love this one partly because this is the first pincushion I've ever made that I used my carved stamp for! The "Sewing!" stamped on the linen piece is one ofthe stamps I carved this week. Remember I told you I've beenaddicted to that too? I also like this one because I think thegirl looks like she is looking at cherry blossoms petals falling. I love the pink snow flakes and miss them terribly already! There are a bunch of them just behind him!So he would just needs to get up and go around the back to discover them. The Heather Ross Gnome fabric is always a perfectone to start a log cabin! 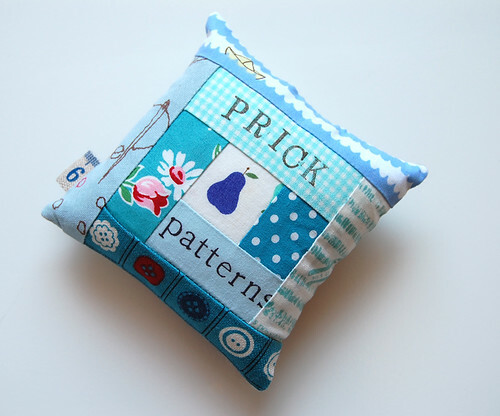 Whenever I receive email to notify me I sold my pincushion, I have such a mixed feeling. Happy and sad.Happy because there was someone in the worldwho wants to welcome my pincushion to her crafty space.Sad because it means I have to part with it.This one was particularly a hard one to part with! This one was so much fun to make, I remember! I've always thought pink is the dominant color in my fabric stash, but lately I realized I probably havemore aqua fabrics than pink fabrics. 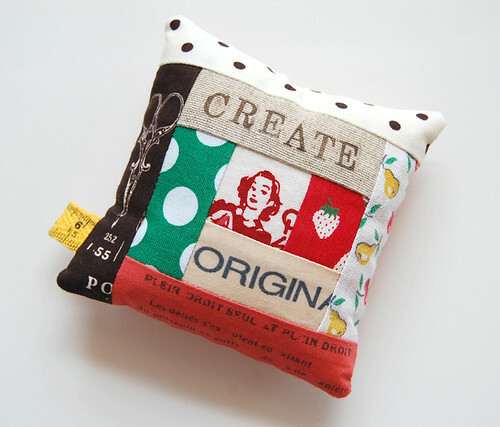 The bigger the stashto pick fabric from is, the funner it is to make pincushions. I covet this poodle fabric and have always wantedto make a pincushion using it. There may be a little too much going on, butI think it turned out sorta fun! I picked up the bike stamp before I started carving stamps.Now I feel like I may be able to make a stamp like thatwith a little bit more of practice! This one makes me think of vintage style a lot ;)It found such a nice new home! I love this one too. 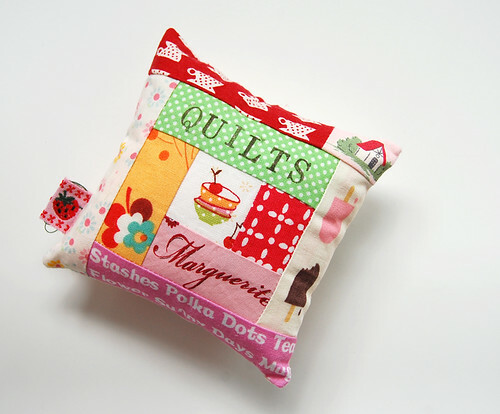 I'll have to make more pincushionswith a sewing machine in the middle more often! I had a lot of fun making it too. The linen looking fabric at the right bottomis not linen. 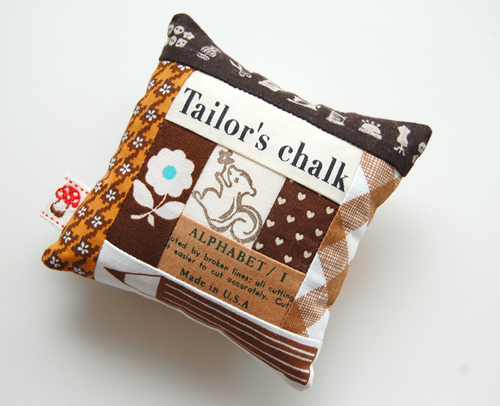 It is printed cotton that looks like linen and a button. So fun! 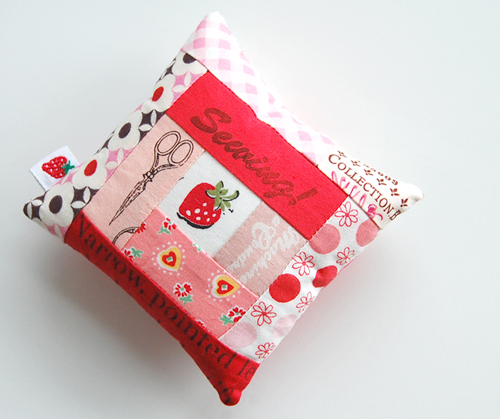 I'll probably keep making more pincushions for my shopfor a while, hehe. Oops I almost forgot! The winners of the package of Aurifil threads are:Sarah, Joyce Carter, Karen P, Beezus, Dakota sews!Congratulations girls ;) I'll contact you all shortly! Stunning, I love them all and your fussy cutting is brilliant as are your colour palettes. Inspirational well done! 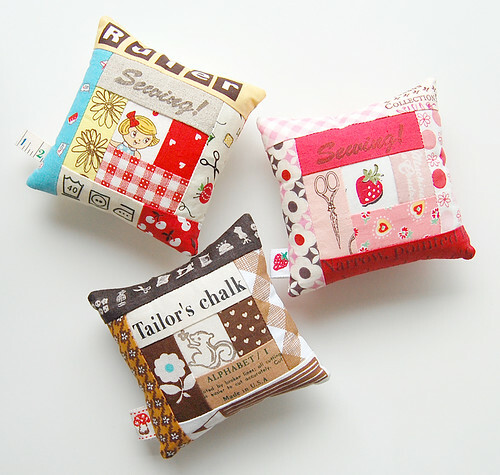 These pin cushions are so lovely, i like how all the patterns on the fabric some how all suit one another! Your pincushions are just so cute. I'm noticing the little tags on each...is that just ribbon to give it a bit more interest or do they have your name on them?...curious, curious. One is most beautiful then the others! I loved it! I must try to do this, for sure! Regards from Brazil, dear Ayumi! They're all beautiful....i love looking at your projects...very inspiring! 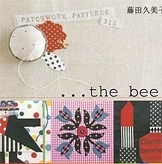 Will make these pincushions soon...thanks,Ayumi!! Oh, I love them all! 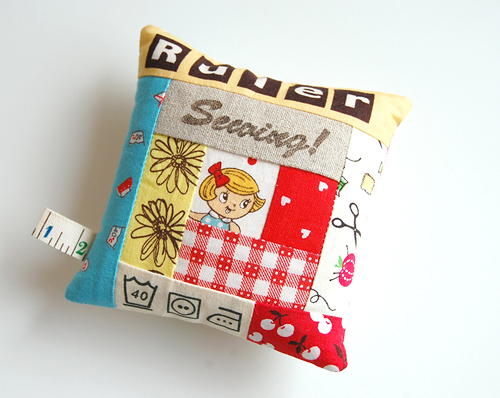 You + Pincushions are always a wonderful thing! super cute! i don't think i could pick a favorite, they're all so sweet! Each one is so adorable! Keep on making them...I would never get tired of seeing more! They are all adorable!!! Love the stamping! Each one of prettier than the one before. I can understand why you would be sad to part with them. But rest assured you have used those fabrics perfectly and they are all going to VERY happy homes I'm sure! 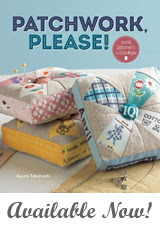 These are all so pretty Ayumi - lots of fun to look at so show away!! Your carved stamps really accentuate these beautifully too. I don't think I will ever get tired of seeing your pincushions!!! Each and every one is so so so cute!!! I really like the new stamps you are making. I honestly can't even pick a favorite. They are that cute!!!! As usual, just perfect projects from you. Just adorable. I must have missed you talking about carving stamps. I have some tools and materials here, but need a jumpstart. Could you point me to where you mentioned carving? Keep going with your obsession - they are gorgeous. 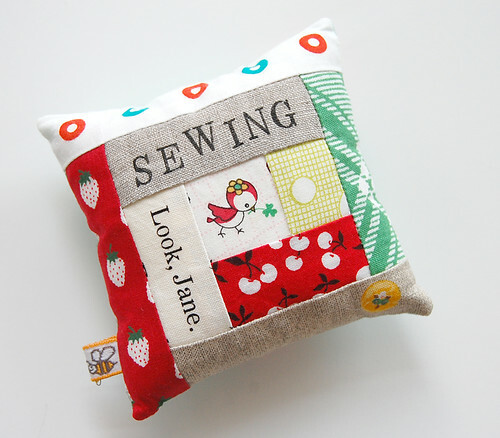 The stamping + fussy cuts make these new pincushions so much fun to view. But even if they weren't, the point is that they make YOU happy and that alone makes ME happy. Oh they are all so beautiful!! So adorable! Each and every one. i love them all! the one with the sewing machine is my very favorite! the last one really put the size of these into perspective for me because i have the print with the little birds and they are really small. just adorable! They are all so darling. Your stamps are great too. Too cute Ayumi!! Your stamps look great too, love it all!! Ha! I saw that first pincushion and thought, oh jeez how good could this post be, you've seen one pincushion you've seen them all... Boy was I wrong! They are all so original and cute. I would be hard pressed to pick a favorite although the chipmunk with the apple tree on the reverse is so sweet! Your pincushions are totally adorable. I like your carved stamps very much and wish you would talk more about how you make them. I love these! So cute! I wonder though, what do you put inside your pin cushions? Are they soft and fluffy, or do you put grainy things? Just curious! Oh Ayumi! 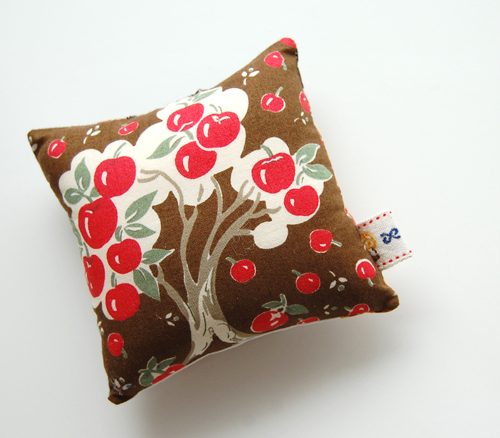 These pincushions are so so charming! Well!! I think I need one for myself, off to stalk your Etsy store! Your fussy cuts are inspiring and the way you select fabrics to go together is something to aspire to. I will never get tired of seeing your work! Must have 1 as I collect them. They had me smilen& laughing by myself. Good job. OLA, SEU BLOG É MUITO LINDO O SEU TRABALHO É MARAVILHOSO UMA PERFEIÇAO E DELICADEZA OS TECIDOS QUE VOCE USA SAO LINDOS DELICADOS E CONVERSAM ENTRE SI ,ADOREI ENCONTRAR UM BLOG ASSIM PARA OLHAR FAZ BEM PARA ALAMA VER COISAS TAO DELICADAS E PERFEITAS.PARABENS. 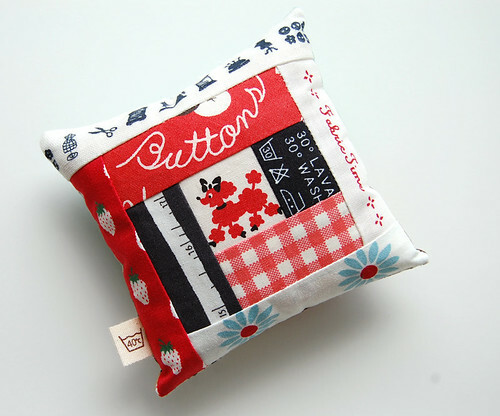 Goodness they are all utterly adorable, you might make me addicted to pincushions too! Cute! I want them all!! They are all beautiful... I envy you your stash, and your ability at carving stamps! I giggled a bit at 'Prick'! these are absolutely adorable. I love each and every single one of them!! Hi! I am Júlia from Barcelona, Spain. Now I follow your blog. Great works! Just beautiful, Ayumi. Soo, so, so darling, all of them! Your addictions are just roadmaps to what my next addictions are! What ever you do, I WANT TO DO TOO! Oh my oh my oh my oh my are your pincushions adorable! When I read my email on my phone last night, and got my nightly flickr mail with all my contacts' upload, I knew the minute I saw the thumbnails or your pincushions that they were yours. I almost hopped out of bed to go look on my computer. If my cat wasn't snuggled and nested in my legs - I so would have gotten up! Adorable. I love the one that says "Prick" hahahaha. As always everything is so fun and fresh looking! 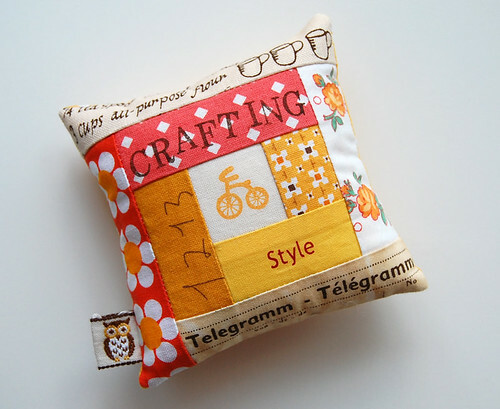 I love your stamp making and using it on your sewing. That is so much fun!! Show us as many as you want!! As usual, I am delighted and in awe of your work. So adorable -- all of them! The fabrics are amazing, and the way you put them together is nothing short of inspired. Gifted, my dear, you are gifted! I hope you are having a wonderful day! I never get sick of seeing your log cabins! Anyone can make a log cabin, but yours are so original. You have a great knack of picking unique fabrics. And I can spot your work anywhere! 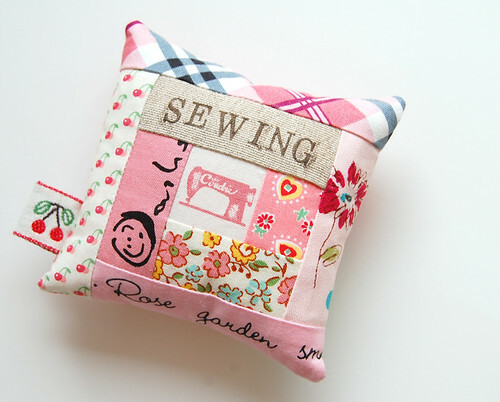 I saw your pin cushions on Pinterest - they are lovely! I'm following your blog now so that I can see when you will add more to your shop as I would love to buy one! I love your addictions, I'm never bored about them ! Your pincushions are just so sweet, I'll never stop wathing them! Adorable! Love them all! Quick technical question... beside the stuffing what do you put in them so that the pins don't go through the back? You are very talented! Thanks for sharing! WOW! Your pincushions are lovely, sweet, funy... great! :-) And you used really nice fabrics! :-) J.
Які ж вони всі гарні. І скільки їх, я збилася з рахунку! oh ayumi, i love these all so much! if you decide to make another one like the one with the pink sewing machine in the middle that you stamped "sewing" on please let me know. 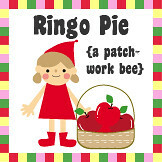 i want to buy one from you! xoxo love them all! I really love them all! 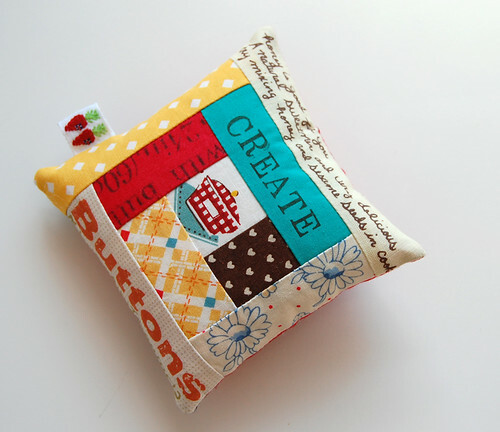 I'm so happy to have my little pincushion treasure made by you (and of course, a happy potholder, too!). And I don't think I could ever tire of them! They are all so cute, a girl can never have too many pincushions. Oh. My. Goodness! You continually amaze me with the level of cuteness in your projects, not to mention the level of detail! Its a amazing and beautiful collection, and the colors is making them more eye touching! Great ideas, like always! I am very much impressed with your work.. They are darling! I LOVE pincushions! Thanks so much for all the ideas!